A Black Life Finally Matters in Chicago! Or does it? 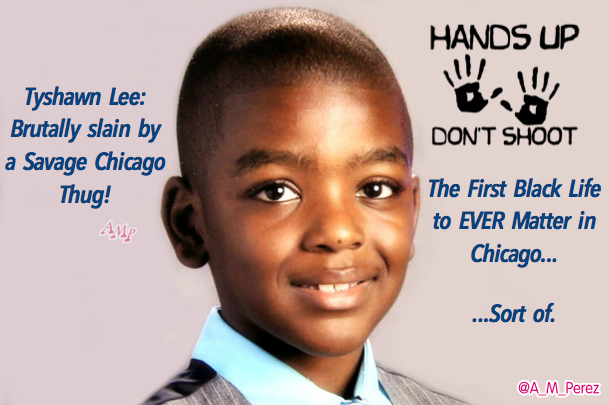 Gun Grabbers gain a victory with the death of 9 year old Tyshawn Lee! Chicago’s gun free environment served up another death and a grave for anti-gunners to dance on while they blame guns. Of course we all know that Chicago isn’t gun free, it’s only gun free for law abiding citizens who want to protect themselves from thugs. There is just one problem. This particular victory for the left’s anti gun crowd comes at the expense of the Black Lives Matter movement’s attempt to keep black on black crime out of the main stream media. For the first time since the 1929 Valentine’s Day Massacre, a Chicago murder has hit the national news. Also a first, a black life matters that isn’t a thug killed by a police officer in the line of duty during the commission of a crime, or similar situation. Let’s see if the Black Lives Matter crowd are as ambitious to solve the murder of an innocent black kid as they are to lie about hands being up when the thug Mike Brown was shot. Let’s see if they’re as keen on finding the murderer of Tyshawn as they were to send a patsy to murder Deputy Darren Goforth in Texas, who was just filling up his squad car with gasoline. There isn’t a lot of information out there about the gunning down of Tyshawn. The prevailing question seems to be whether or not he was targeted or caught in the cross fire. Well, let’s think about that for a second. The police report says that an unknown number of people were gathered in the alley that Tyshawn was shot in. The number is unknown, but the term gathered implies at least a small crowd. There is no mention of a number of people being shot. Tyshawn was shot several times in the upper body, back and head. He’s a small, 9 year old kid. If all the shots hit him and no one else, I think it’s safe to conclude that he was targeted and move on to solving the crime. Another assumption that is probably safe to make is that the unknown number of people who were gathered in the alley know exactly who did the shooting. If black lives matter, these people would come forward and help the police identify the savage thug who shot Tyshawn. There would be no need of a reward, they would do the right thing. There is a reward being offered and the number keeps going up. I’ve seen the reward for information leading to an arrest go from $11,000 to $17,000 and then to the $20,000. The fact that the media reported this non-cop involved shooting of an black person who was actually innocent gave me hope that black lives are going to actually start to matter. But apparently it’s going to cost more than $20,000 to make Tyshawn’s life matter to any witnesses of the shooting. Maybe it’s premature to call this the first black life that mattered in Chicago. One person named Lakesha Alexander, who was interviewed by the media said, “I was angry, I was upset, I was hurt – all at the same time. There is no one here protecting these kids.” Well, whose fault is that Lakesha? You have allowed your state to systematically disarm you and take away your ability to defend yourselves and your children. You have abandoned your God given right to self defense in exchange for a false sense of security, which we all know does not exist. You people of Chicago don’t have to allow your city or your state to disarm you and leave your kids vulnerable. Someone could have been there to defend poor Tyshawn, but there wasn’t. If you people are angry, upset, and hurt over kids not having any protection, you need to direct that anger right at the bathroom mirror. It serves the left’s best interest to cover up all of the black on black crime (unless we are assuming the killer was a white guy) in order to perpetuate the Black Lives Matter premise that the only danger to black people is police. The particular heinous nature of this attack upon a 9 year old kid left the media with no choice but to report it. The only way they’ll get any leftist mileage out of it now is to throw this bone to the Moms Demand Action for Gun Sense In America crowd, so they can dance on the grave and blame the gun. How much higher does the reward have to get to make Tyshawn’s life matter more than the thug’s who shot him? Previous GOP Primary Poll – Post CNBC Debate! I really don’t know what you are talking about. Read my article. I am asking parents to be protective of their kids. I don’t know you and never accused you of anything. That one statement by Lakesha Alexander illustrates the problem perfectly. “There’s nobody around to protect the kids”. Amazing. Whole neighborhoods reject the cops, then complain when they aren’t there to protect the kids. I mean, the hypocrisy is stunning. No one smashed you. No one knows who you are. Great observation! So happy that you think enuf of your fellow Americans, to give your time so that their lives will be safer.